The Caribbean offers an unequalled playground. To be (re)discovered urgently! Cuba doesn’t only offer grandiose scenery and a fascinating history, you will also find some incredible underwater life! 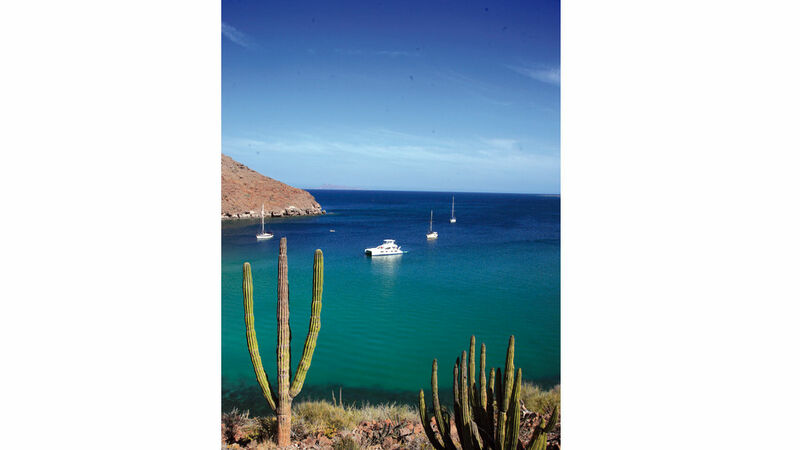 Baja California offers a certain change of scene, as well as the possibility of cruising and swimming among the whales. If you pick up your charter boat in Martinique, don’t hesitate to stay there for a few days before heading south towards the Grenadines. 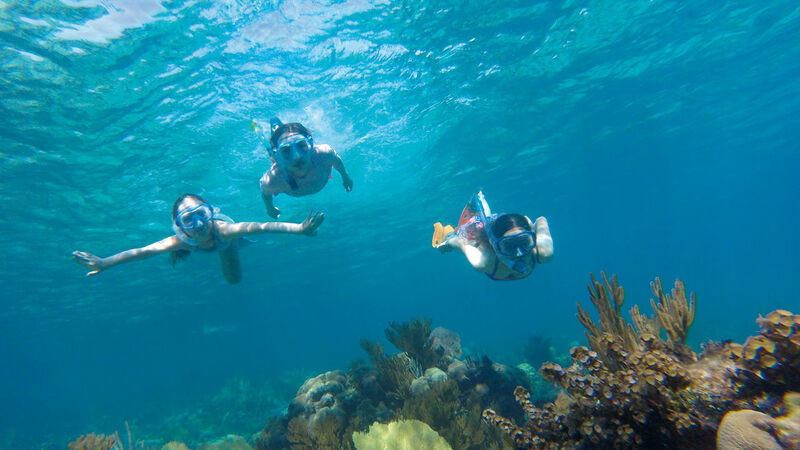 Belize is an exceptional destination, not very busy and with an incredible coral reef. To visit or re-visit! At the back of a seemingly endless creek, a little harbor opens up, with room for just a few boats. Your catamaran is there, in front of the taverna. Welcome to Greece! The Scandinavian fjords offer unique scenery and atmospheres! Water the same color as in the Polynesian lagoons, which is found however...in Sardinia! For certain round the world sailors, Corsica is the most beautiful place to cruise in the world. Something to think about when choosing a destination! The unique atmosphere in the little Scottish ports at the exit from the famous Loch Ness. Polynesia, every sailor’s dream, is now within reach…of an airplane! Australia and its Great Barrier Reef. A distant destination, but…wonderful! Thailand, its colors, its atmospheres, the inhabitants’ kindness: a destination you ABSOLUTELY must visit! Madagascar unique, beautiful and so wild. The ultimate destination? Do you want to really enjoy your holidays in a cat or a trimaran to the full? Well you will have to prepare a little in advance, so you don’t find yourself sailing with the Meltemi on the nose in Greece, or subjected to the monsoon in Asia. Enough to get organized and prepare a genuine round the world voyage! If you want to sail in the warmth during the winter, you must go to the West Indies. 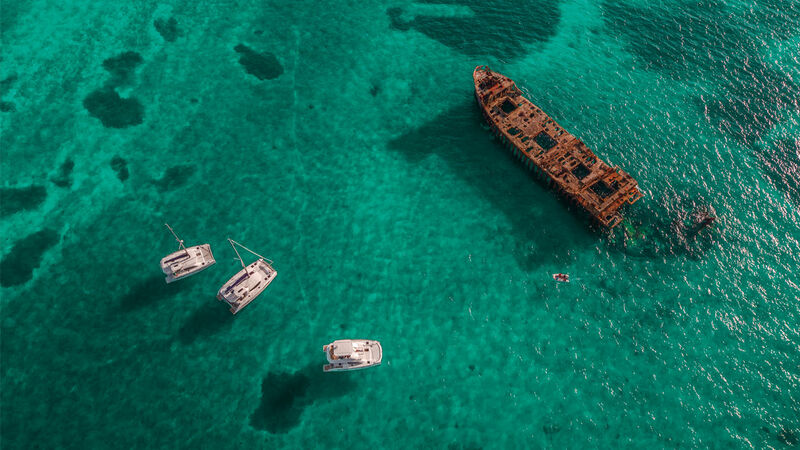 Here we find the biggest concentration of charter companies, and the string of islands from Grenada in the south to the Bahamas in the north is certainly the most beautiful playground that exists for lovers of sailing vacations. Here we find hundreds of islands of all sizes, and thousands of anchorages. The most pleasant period for cruising in the West Indies? From November to June it is fine and warm. The summer is wetter, and the months of September and October can be very stormy, with a real risk of hurricanes. The main departure areas in the West Indies are the French islands of Martinique and Guadeloupe, the Virgin Islands, the Bahamas and the area along Central America. Leaving from Martinique, you have the choice between remaining locally and enjoying one of the most beautiful islands in the West Indies, with a particularly wild and not very busy windward coast, or sailing south towards the Grenadines. The Grenadines are certainly THE ideal destination in a cat. Here you will find numerous anchorages, all absolutely superb. 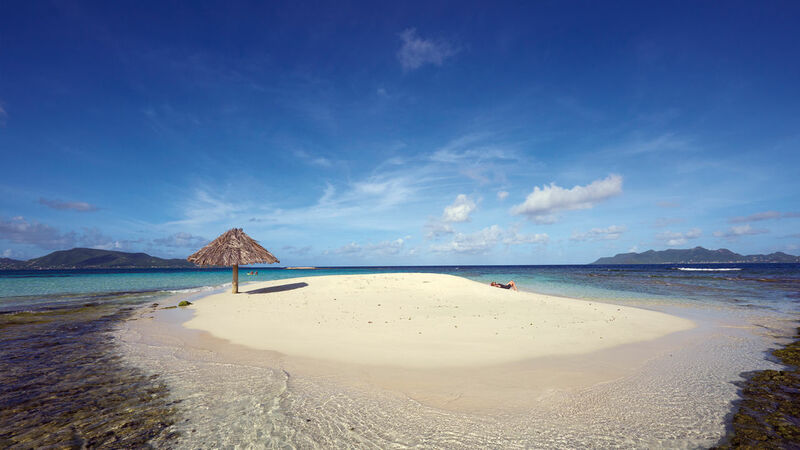 Moreover a number of films or advertisements have been shot in these delightful islands. Another emblematic place in the Caribbean is the British Virgin Islands. Here is a feast for your eyes! The Virgin Islands, with around 40 islands plunged into translucent water, are amazing for everyone. The anchorages are only a few miles apart, mooring buoys are available for the night, and the sea here is always calm. The steady trade winds provide an ideal climate, which makes this stretch of water the ideal playground for families and novice crews. As the flora and fauna are well-protected, the underwater life offers some extraordinary encounters. 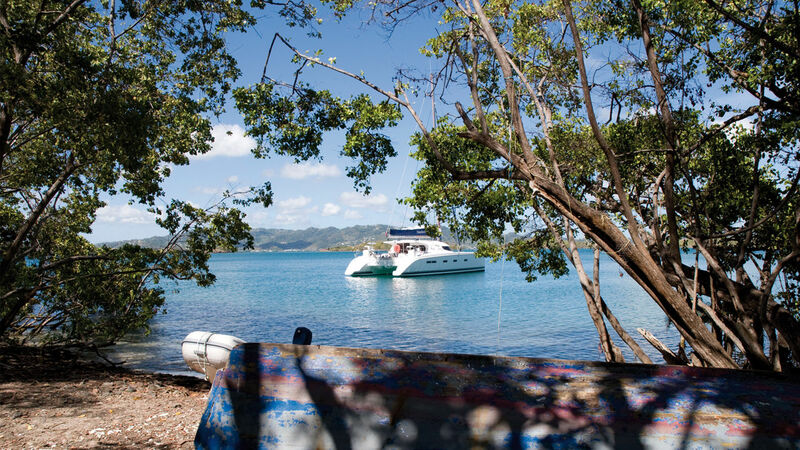 In a word, a visit to the Virgin Islands is essential for anyone who likes cruising in the tropics. 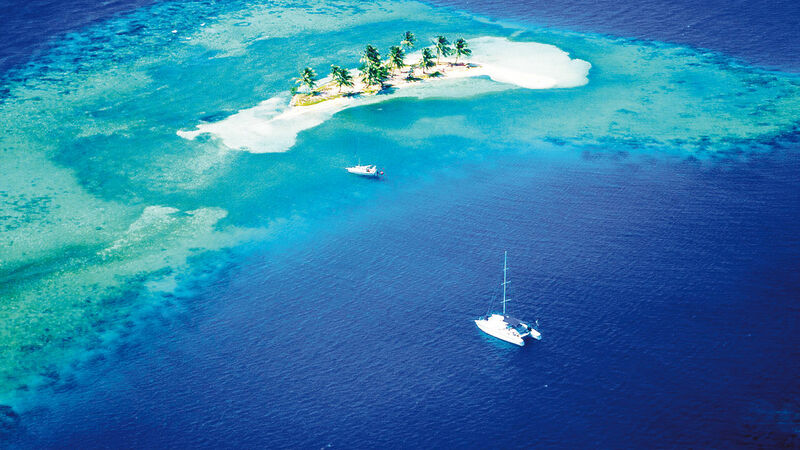 And then of course there is Belize, the San Blas, the Guadeloupe archipelago, and one of the most beautiful anchorages in the world, the one at Les Saintes. In fact the area is so vast and beautiful that you could easily spend a lifetime here! All the year round, but the best is from February (a bit cool) to June. The summer is hot and wet. A week’s sailing in the Bahamas is very good. The dream: two weeks, enough to explore an infinite part of the 700 large and small islands in the Bahamas.